Hi, my name is Chris and by now I hope you've had a look around my site and are enjoying the content. 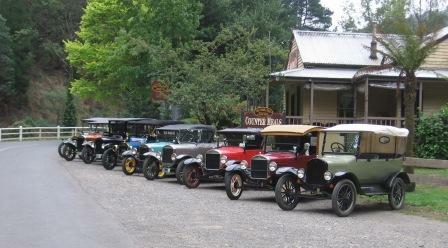 What's my Model T story? 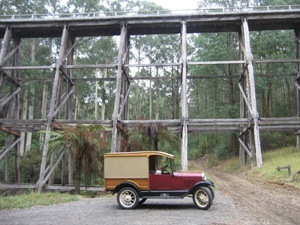 Well, if you had told me 6 years ago, that I'd own a number of Vintage and Classic cars, be Editor of a Model T Ford Club AND have the ability to build a website, I'd have laughed at you! But it's true. Like most people, I had always known of the Model T and had an interest in cars in general from my teen years, but it was purely fate that I ended up owning a T.
My partner and I had bought an early Mini and after discovering it was quite a rare model, and a 6 month restoration it was taken off to a specialist Insurer and Auction house, where, you guessed it.. My first T was sitting. Somewhat unloved, it was actually a TT (the bus featured in my trucks gallery). The salesman told me that it originally had been parked to sell along with a Tourer by the owner (which sold) but a year later contact with the owner was lost and nothing had been done. You know that feeling when you suddenly get a "rush" to the head, the light bulb moment? Well we live in a tourist area filled with wineries... What a great idea! 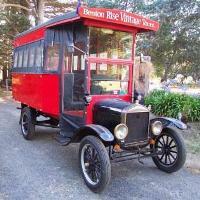 Winery tours, vintage bus, wineries, easy! I learnt how to drive a T from searching the internet. Trouble is, I was generously helped by the owner of a LHD vehicle, and, being in Australia, was operating some things backwards. So we drove that heavy, over tall bus, back home, 20 miles and about 20 miles an hour, with it spitting through the carburettor, the clutch discs slipping and oil and water leaking from everywhere. And so my rather STEEP learning curve began. I joined the local club and soon discovered a world of information, experience and resources. Not long after, I volunteered to become the Editor of that club and remained so until only very recently. I have made some amazing friends and learnt an ENORMOUS amount, lucky enough to spend a lot of time with a very experienced mechanic, machinist and engine builder. About 3 years ago, I addded the Shooting Brake to my collection so I had something a little faster to tour in. Well after having another "rush" to the head, it occured to me that it's not just that easy to find a good range of information on everything Model T, most was held by various clubs around the world on the internet or in books. Photo's are everywhere, but not always big enough or clear enough, especially as references. This is how I came up with the idea of a website gallery. By now it was approaching Chistmas in 2007 and I was using the internet to research antique pocket watches, as an intended gift. I found an amazing site dedicated to all things antique pocket watch and down the bottom, was a link to "SBI! and my site". And this is where it all began. Dubious, I started reading how SBI! could help me build a website. Now before you stop and think "I can't do that, BELIEVE me you can. You don't need ANY skills. All you need is to be passionate about something, after all, everyone knows about something (remember this, because you'll hear it again and again and it's true) and you can turn that passion into an amazing website! I, like most people, can turn on a computer, surf the internet and do basic things. I had NO idea how the internet worked, what HTML was or how you even looked to find someone to do it for you. I built this site using SBI!, with no education, no seminars, no tricks and no one elses help (well except for the wealth of information on SBI!) Now I would consider myself to be a cautious person, so I sat back and watched this 2 and 1/2 minute video on SBI! What amazed me when I took a look at the video tutorial, was that the emphasis over and over again, was that this was NOT about being a get rich quick scheme nor a quick and easy way out. I've always believed you don't get something for nothing and here, again, was this message, reinforced again. It's about research, planning and quality information... What's the point in paying someone to build you a flashy looking website that NO-ONE ever finds on the internet? I have friends that have done this for their businesses and my site already gets more visitors after one year on the internet! The more I looked, the more I found there is to SBI! and seeing the no risk trial, I figured it was worth a shot. SBI! stands for Site Build It. They'll help you find the right topic and approach for your site, help you build it, help you get traffic to it and teach you how to make money from it. My goal was always to make a website on Model T's, the fact that it can pay for itself is a bonus, and I'm only just starting out. Have a look at these successful people who all used SBI! There are hundreds of examples in the categories and they are all in the Top 1% of websites on the internet. Yes it does take work and it does take time. And before you say you don't have time, you do! Really! I used to say that. I commute on one of the worst freeways for congestion in my home state here in Victoria. 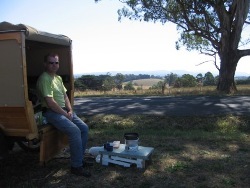 I get up at 4-45am everyday to drive 40 miles (65 km's) that at BEST takes me an hour, work a full time job, commute back home (which is always slower), work on my T (and others with my mechanic friend - I consider it Model T School) on Saturdays and restore Vintage Caravans on Sundays (another hobby) I live on acreage that needs mowing and maintaining, so if I can find time, so can you! Do what I did, sacrifice a night of TV and dedicate it to something worthwhile. One of my other interests is growing my own food and I have been running a large vegetable patch, fruit tree orchard and various berries for 15 years. Take a look at my other website that is still expanding as we move through the seasons.. ANYBODY can do this and be successful, actually MORE successful than many of the professionally built sites around. I figured "What have I got to lose other than a few hours of my time" It's risk free with a total money back guarantee. I had a go at it, and look! You're here on my site.. Why not try it yourself?